JACII members in Detroit for the inaugural group meeting. The week began with honoring Martin Luther King, Jr., who committed his life to fighting for civil rights and justice. It ended with the inauguration of President Donald Trump and increased fears about the future of those same rights. Trump will fulfill his campaign promise to defund Planned Parenthood and appoint Supreme Court justices who will overturn Roe v Wade. It is now time to turn that fear into action. We lost the election, but not the fight. In other news, JAC is excited to announce the formation of our newest group --JACII. More than 30 young women and men gathered in Detroit this week to learn about JAC. We are excited to have these young professionals join us. We also have a JACII group starting in Chicago. If you know young women and men in your area that would be interested, contact the JAC office at 847-433-5999. We can help them get organized. Israel's recently upgraded critical ballistic missile shield became operational this week. The upgrade offers the Arrow 3 missile defense system a "Star Wars"-like extension of its capabilities to outer space where incoming missiles can be safely destroyed. The Defense Ministry said the U.S.-funded system, jointly developed by state-owned Israel Aerospace Industries and U.S. firm Boeing Co., has been handed over to the Israeli Air Force. IDF Deputy Chief of Staff Major General Yair Golan was in Brussels for the official opening of the Israeli office at NATO headquarters, after it was decided that the two sides should have a closer working relationship. This is the first Israeli representative to NATO since the Jewish state was accepted as a partner to the organization (not a member). While in Brussels, Golan also met with the head of the Turkish Armed Forces. In light of the Israel-Turkey reconciliation agreement, and at the behest of the Americans, the Turks have rescinded their opposition to Israeli participation in NATO. Israel's right wing has been eagerly awaiting Donald Trump's arrival in the White House, hoping a Republican president will usher in a new era of support for Israeli settlement building on land Palestinians want for a state. The far-right Jewish Home party, along with members of Prime Minister Benjamin Netanyahu's Likud party, is promoting legislation that would effectively annex one large settlement in the occupied West Bank to Israel and another bill that would legalize dozens of unauthorized outposts. The founder of the popular right-wing blog The Right Stuff resigned over the revelation that his wife is Jewish. Mike Enoch, who also co-hosts "The Daily Shoah" weekly podcast, was outed over the weekend as Mike Peinovich, a website developer from New York. On the podcast, which has about 100,000 regular listeners, Peinovich as Enoch, talked about killing Jews and spouted neo-Nazi invective. In the U.S., the movement to boycott, divest from, and sanction Israel (BDS) -- together with the various modes of anti-Israel and anti-Semitic propaganda that come with it -- has primarily made itself felt on college campuses and in academic organizations. The FBI and Department of Homeland Security will be assisting Jewish Community Centers around the country in bolstering security after 16 JCCs received bomb threats on the same day. On Wednesday, officials from the FBI and Homeland Security conducted a conference call with U.S. Jewish communal leaders to discuss the incidents, what they stem from, and how to craft protocols to handle such incidents in the future. A recent report from a pro-choice group paints a grim picture of reproductive health care in this country. On a scale from "total access" to "severely restricted access," 26 states scored as having "severely restricted access" to reproductive health care. This is due to the states' abortion bans, bans on counseling or referring women for abortions, and TRAP (Targeted Regulations of Abortion Providers) laws that impose onerous requirements on abortion clinics to prevent them from providing abortions at all. A woman who suffers mental or physical distress in the after math of an abortion procedure would have a legal cause to bring civil action for damages against the physician who terminated the pregnancy under legislation getting consideration in the Iowa Legislature. A growing numbers of U.S. states are seeking to ensure that women have continued access to free birth control in case the insurance benefit is dropped as part of President Donald Trump's vow to repeal and replace the Affordable Care Act. What's Next For Republicans' Nationwide Abortion Ban? 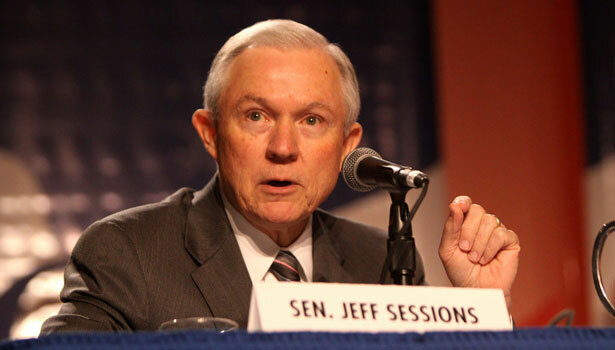 While Sessions doesn't want to erase the proud history of the Confederacy, he does want to erase Jefferson's wall, the foundation of this country's religious freedom, which he called a recent creation and not historical. And Sessions has, unfortunately, been consistent with his views about mingling church and state. Here are just a couple of examples out of many. President Donald Trump came out against school gun bans while a candidate, when he compared the policies to "offering up candy to bad people." Though he lacks the constitutional authority to unilaterally reverse the standing federal statute on gun free zones at school "on day one," as he promised, Republican legislators on Capitol Hill are taking steps that could clear the way for more firearms in the nation's classrooms. Senate Democrats are gearing up for a potentially ugly fight over Donald Trump's U.S. Supreme Court pick, with some liberal activists urging them to do everything possible to block any nominee proposed by the new Republican president. Generally, inaugural addresses are not designed to be fact-checked. But President Trump's address was nothing if not unique, presenting a portrait of the United States that often was at variance with reality. Here's a guide to understanding whether the facts back up his rhetoric. Democrats are bracing for the unknown as they barrel toward the formal start of the Trump era. Friday marks the opening of the first unified GOP government in roughly a decade. It will also be the first time that almost two-dozen Democratic senators - about half the caucus - elected during President Obama's tenure will serve under a Republican president. Any time a new administration comes into office, there will be some complaining about the new president's cabinet picks. But we're seeing something extraordinary happening now. Donald Trump's cabinet brings with it a combination of ethical problems, inexperience, hostility to the missions of the departments its members are being called to lead, and plain old ignorance that is simply unprecedented. National ambition is part of it. Sen. Sherrod Brown (D-Ohio) didn't hesitate. "I'm going," he said of Friday's inaugural ceremonies for President-elect Donald Trump. "I want to be there," Brown said. His presence would "remind" Trump and other Republicans of the fights ahead on banking, civil rights and other issues on which there is a deep divide with Democrats. When President-elect Donald Trump replaces Barack Obama, the Democratic Party will find itself more removed from power than at almost any point since the party's creation. Scorned by the same voters who once embraced the New Deal, built the Great Society, and put their hope in the nation's first black president, Democrats are now locked out of power in Washington and out of two-thirds of state legislative chambers across the country. While almost all eyes are on the Capitol, the most action occurs during the frantic residence changeover two miles away. The most frenzied American ritual you've never seen is called the "transfer of families," a five-hour tsunami of activity that transforms President Obama's home into President Trump's. In an interview with Kol Barama radio, Mark Zell, chair of the Republican Party in Israel, said the couple has been granted special permission by a rabbi to use a vehicle because of "safety" concerns. "When we started on this journey, we did so with an abiding faith in the American people and their abilities, our abilities, to join together to change the country in ways that would make life better for our kids and our grandkids. Change didn't happen from the top down, it happened from the bottom up."